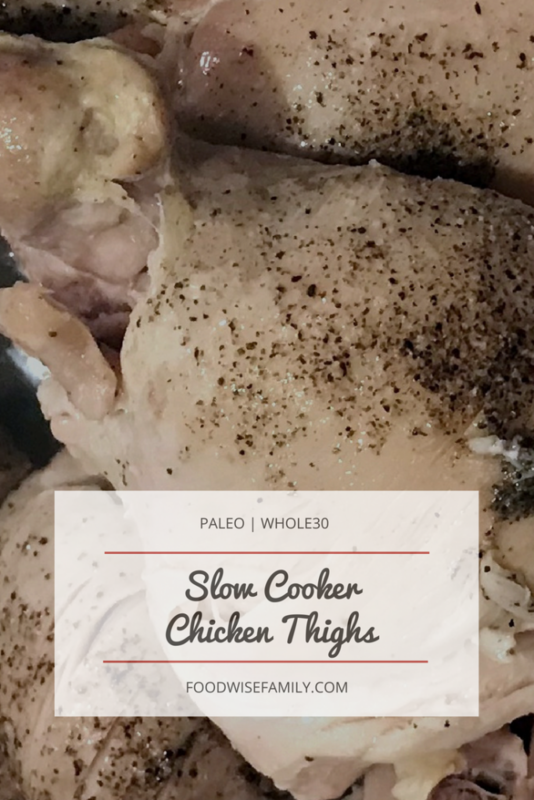 There are a few items you will always find as staples in our kitchen, and our slow cooker chicken thighs are one of them. 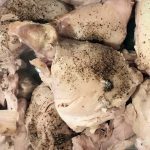 Having slow cooker chicken thighs just waiting in our refrigerator, makes lunches and dinners so much easier. 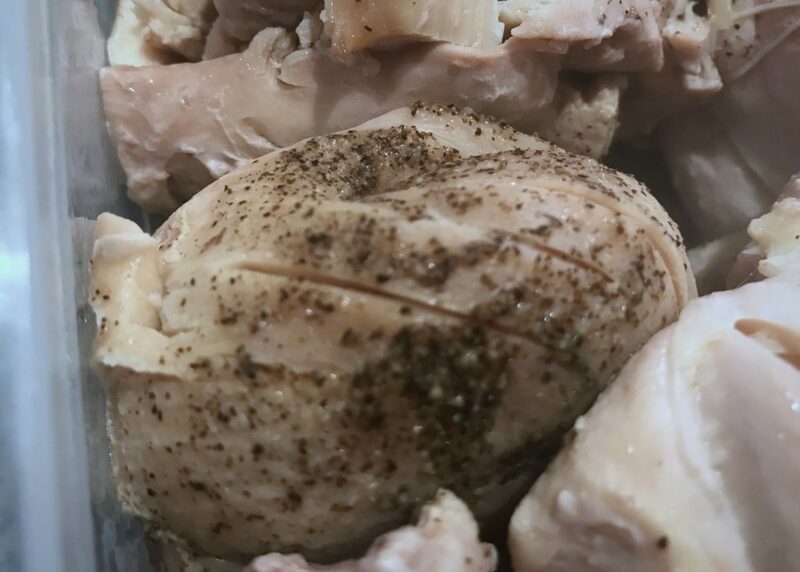 The great part about using chicken thighs vs. breasts is that the fat on the thighs melt off and keeps the chicken so moist while it cooks. Whereas when we have tried chicken breasts with some olive oil, it comes out dry. 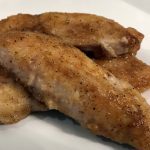 There are many different ways to do chicken breasts in a slow cooker so they come out juicy, but we really wanted something we could just throw in the slow cooker, put a little bit of seasoning on it, turn it on, and be done with it. So chicken thighs won. Having a protein already ready for a meal is essential, especially if you are busy during the week. It’s one less thing to think about. In our house, we do our best to plan our dinners every week (thanks to my husband), but we don’t plan out our lunches. This is where slow cooker chicken thighs save the day or at least lunchtime. If there are no leftovers in the fridge, out come the chicken thighs, some fresh veggies, and more than likely some roasted sweet potatoes. There are also moments when it saves dinner too. Whether you forgot to thaw your meat, or you seriously just don’t want to cook one more thing, chicken thighs to the rescue. 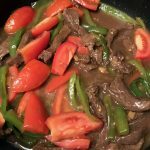 Having a protein already ready for a meal makes the rest of the meal that much easier to prepare. 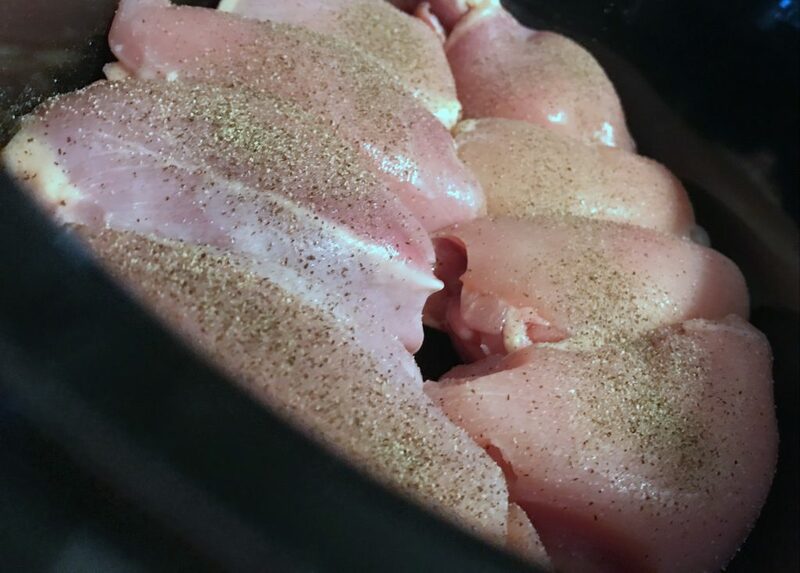 Place 3 to 4 lbs of boneless, skinless chicken thighs (about 8 thighs) in your slow cooker. Don’t trim the fat. Sprinkle the chicken thighs with a half a teaspoon of both salt and pepper. Cover and let cook on high for 2-3 hours. 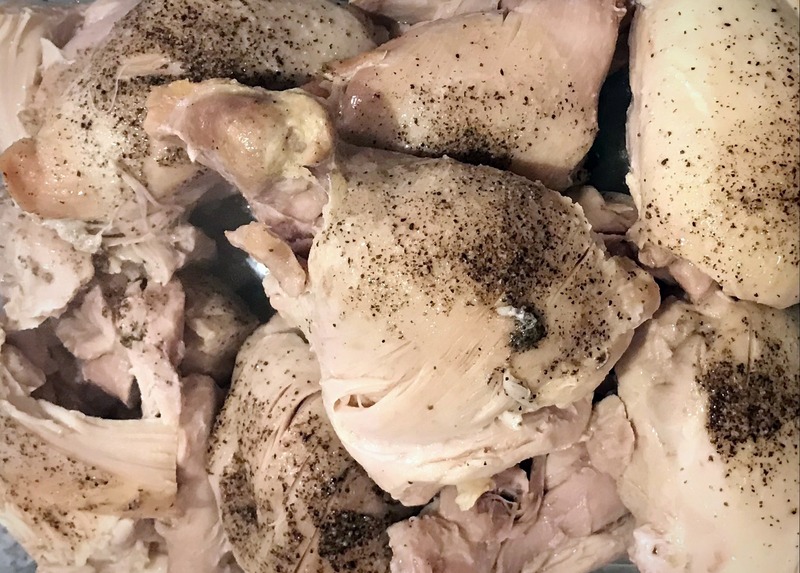 Once the chicken thighs are done, remove from the slow cooker. 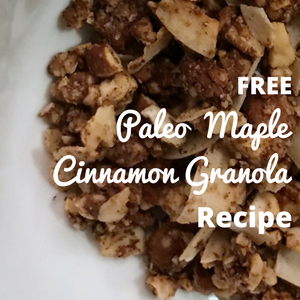 You can shred them with two forks, or leave them whole. Place chicken thighs in your airtight storage container. Take 3 to 4 tablespoons of the fat from the slow cooker and generously pour over your chicken thighs. This will help them keep moist during storage and reheating, plus it makes the chicken extra tasty. Store in the fridge for up to a week. 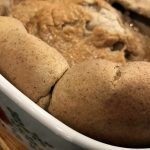 Having slow cooker chicken thighs just waiting in the refrigerator, makes lunches and dinners so much easier. Place chicken thighs (don’t trim the fat) in the slow cooker. Cover and let cook on high for 2-3 hours. 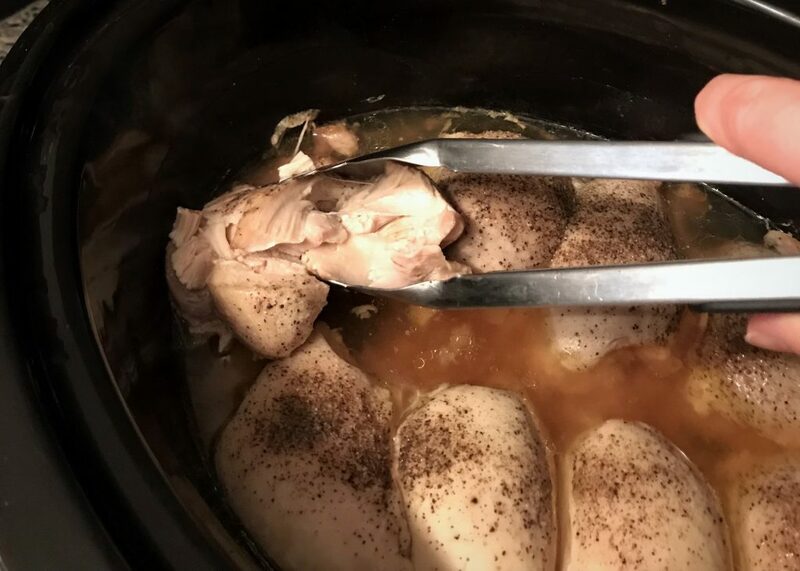 Once the chicken thighs are done, remove from the slow cooker You can shred them with two forks, or leave them whole. Place chicken thighs in your airtight storage container. Take 3 to 4 tablespoons of the fat from the slow cooker and generously pour over your chicken thighs. This will help them keep moist during storage and reheating, plus it makes the chicken extra tasty.